There is a profound connection between music and abstract art and the word often applied to both is colour. In 2008 Mia visited the Steinway factory in Hamburg and became fascinated by the process of making pianos. Two years later, she ended up painting a concert grand piano at Steinway Hall in London. The unforgettable experience of transforming a black piano into ‘Dancing Soul’ was inspired by ‘Les Ballets Russes’ and Diaghilev, a fascination which started with a childhood memory of her mother taking her to see Maya Plisetskaya dance in the North of Argentina. The late Pierre Restany, the critic who discovered Yves Klein, became interested in Mia’s work after she finished at the Accademia di Belle Arti in Venice. In the preface to the catalogue of her 2003 show at the Centro Borges, Buenos Aires, Restany wrote that in an age in which art has become over-rational, Mia’s use of colour to reflect emotion reaches the essence of the human condition. Mia spent 2018 in her studio, with a brand new Steinway Model D piano as her canvas. She called it ‘Chromasoul’. It explores the relationship between music and Nature, most obviously through Beethoven, Schubert, Debussy and through music inspired by faith, including Messaien and Domenico Zipoli, an 18th century Jesuit who taught music to the Guarani people in Paraguay, close to the area where Mia was born. 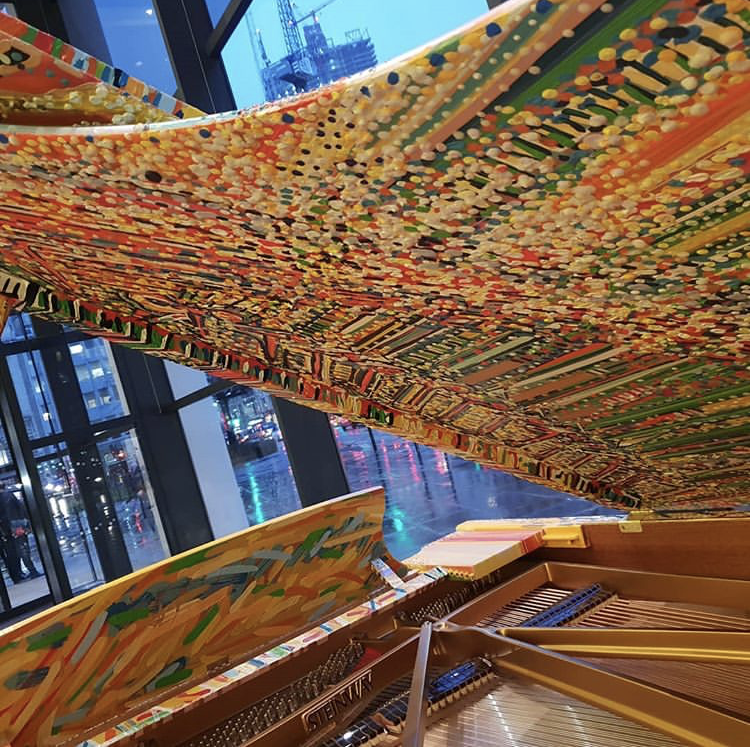 The inside of the piano lid reflects Mia’s experience of painting open heart surgery and a surgeon’s comment that ‘opening a heart is like opening a piano, since each human being has their own music’. Each dot on the piano represents the soul of a human being and also a musical note. Each has infinite possibilities and combinations. Harnessed by our heart beats, music creates the harmony that keeps us in tune with the planet and with each other, but Mia’s strongest impulse is the enthusiasm that grows during a creative journey through a rich palette of colours. Orchestrating superb oil paints made by Michael Harding to create ‘Chromasoul', Mia has transformed the golden energy the sun into an exuberant symbiosis of music, spirit and colour.